On March 1, 2011, Rachel Sutherland, a pregnant 36-year-old Albertan production accountant, found herself unable to breathe. "I woke up at 7 a.m. suffocating," she recalls. "I was terrified. I was drowning." 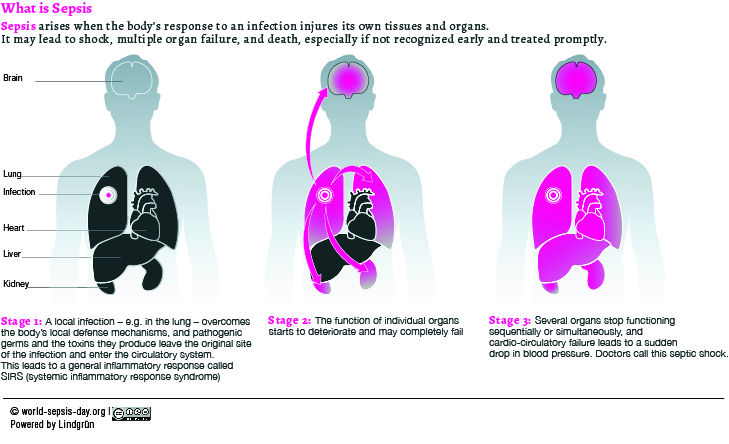 Sutherland had sepsis after developing a lung infection from the H1N1 flu virus. Her immune system had gone into overdrive and was injuring her lung cells. Her damaged and infected lungs were rapidly filling up with fluid. Sepsis -- or blood poisoning -- is when the body's response to an infection spirals out of control and starts attacking its own tissues and organs, experts say. "The body makes chemicals that are meant to fight or react to infections," says Dr. Andrew W. Kirkpatrick, a sepsis researcher and surgeon at Foothills Medical Center and professor of critical care medicine at the University of Calgary in Alberta. In sepsis, these chemicals cause collateral damage to the body's organs, he says. Sutherland -- who was several months pregnant -- was brought via ambulance to Foothills Medical Center and admitted to the intensive care unit. The hospital staff worked tirelessly to save two lives as her organs began to fail. "My parents had to make some serious decisions about whether to save my life or my baby," she said. When she awoke after spending one month in the intensive care unit, she discovered that her unborn baby had also survived the ordeal. "They told me I was having a girl," she said. "We beat the odds. We're both lucky to be alive." Despite major advances, sepsis is the leading cause of death from infection worldwide, according to medical experts. 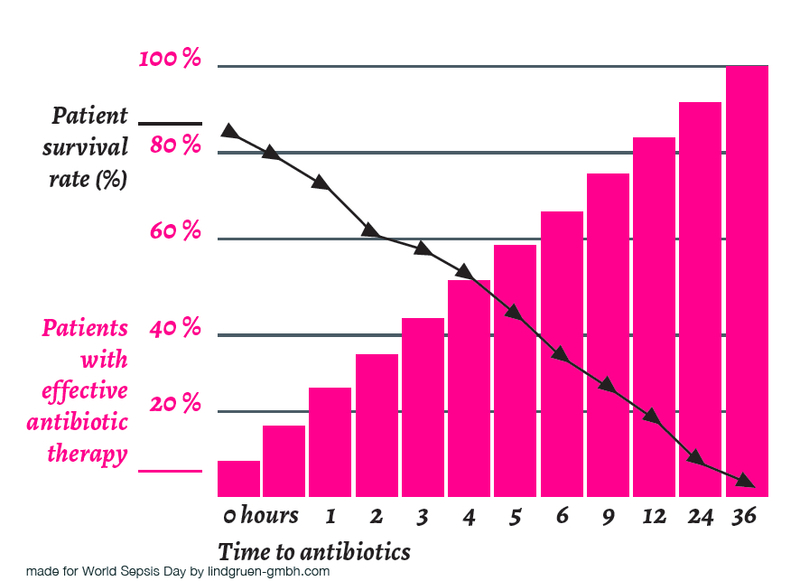 Every hour, about 50 people die of sepsis. Studies show that one in three patients with sepsis will die. "The mortality rate from severe sepsis is 30 to 40 percent," says Dr. Christopher "Chip" J. Doig, medical director of the intensive care unit at the Foothills Medical Centre, team leader of the Alberta Sepsis Network, and professor of critical care medicine at the University of Calgary. Sepsis rates are rising dramatically, he says, adding that sepsis can strike someone in the prime of their life. Sepsis is a medical emergency, says Dr. Graham C. Thompson, a sepsis researcher and an emergency medicine physician at the University of Calgary. "Prompt recognition and management is required," he says, citing research showing that early treatment can halve the risk of dying. "Be aware of the symptoms of sepsis and when to seek medical care," Thompson says, adding that sepsis is often diagnosed too late. If any of these symptoms appear in the presence of a confirmed or likely infection -- seek immediate medical attention, Doig says. "These are all worrisome signs," he says. "You need to see a physician. It's OK to come to the emergency department." Anyone can get sepsis, he cautions, adding that preventing infection is the best way to avoid sepsis. "Washing hands remains one of the easiest ways to prevent the spread of infection," Thompson says. Today's national immunization program includes vaccines that protect against the top three causes of sepsis in children, he says. "Immunizations saves lives," he says, adding that adults also need routine vaccines to prevent infection and sepsis. "All of this likely would have been avoided by a flu shot," Sutherland says, admitting that her doctor had recommended she receive the H1N1 flu vaccine. "I had been too sick and worn down to get it," she says, explaining that she had battled dehydration, fatigue, stress, and malnutrition from severe morning sickness during her pregnancy. Studies show that the costs of sepsis are high -- and rising. In 2008, $14.6 billion was spent on hospitalizations for sepsis in the United States. In Germany, the cost of treating sepsis has more than doubled over the last decade. "The cost is significant," Doig says, estimating that his hospital spends upwards of $5000 CDN per day to care for a sepsis patient in the intensive care unit. Sutherland says that her hospitalization for sepsis cost the Canadian taxpayers nearly $210,000 -- even though she went home three and a half months earlier than expected. While the costs of the long-term impact of sepsis are unknown, research shows that the human cost of sepsis is enormous. Sepsis survivors suffer from lingering physical and psychological effects, Doig says, adding that they often struggle with life after they leave the hospital. Sutherland says that her lungs are scarred from her illness. "I have tremendous anxiety," she adds. "I suffer from depression." New research shows that the body's overactive immune response in sepsis may injure the brain, Doig says. "This might result in damage which is difficult to recognize," he says, adding that the recovery process may take a long time. "I have some memory issues," Sutherland says. "I have to write everything down. It's tremendously embarrassing." "At my new job, I was denied a raise and a bonus because my performance wasn't even meeting expectations," she said, adding that she had a virtually perfect work record before her illness. "Even if you do survive, it takes a tremendously long time to recover from this."